We’d love your help. 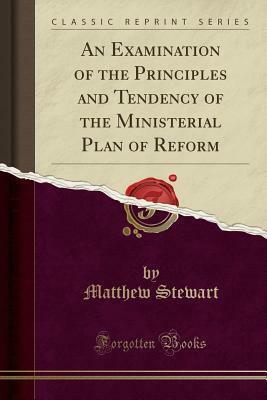 Let us know what’s wrong with this preview of An Examination of the Principles and Tendency of the Ministerial Plan of Reform by Matthew Stewart. If it is intended to intimate, by the restoration of the confidence of the people in the legislature, that the promoters of the present measure of reform have had in view the introduction of a closer connection, and more perfect identification of the people with their representatives and the aristocracy, the degree in which this is likely to be effectual must depend on the means that have been proposed for accomplishing the purpose. The vagueness of such phrases, when applied to questions of government, renders it neces sary to define with some degree of accuracy the idea that those who use them may most reasonably be supposed to intend to convey by them. Language is the medium of thought, and, as philosophers have ex plained to us, the ins/rmncnt of all general reasoning. To ask other readers questions about An Examination of the Principles and Tendency of the Ministerial Plan of Reform, please sign up.